The E100 is the powerhouse of the WSI pump family. Producing a 2 gallon per minute (gpm) flow rate at maximum pressure, it is powerful enough to reliably drive any cutting application while utilizing from 1 to 4 abrasive cutting heads. Proven, heavy-duty, industrial, high-pressure intensifier with ceramic plungers. Slow intensifier speed – 22 cycles/minute. This slow speed both reduces the number of pressure spikes in the system and reduces the number of pressure reversals. This slow speed virtually doubles the fatigue life as compared to other waterjet pumps. Patented “DuraCheck” check valves utilize replaceable seats on both ends of the check valve. This technology, offered only by WSI, greatly extends check valve operational life as it isolates and protects the expensive check valve body from damage. One large (6″ OD) accumulator insures low pulsations in the high-pressure system. 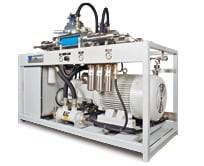 A pneumatic bleed-down assembly provides for depressurization of the high-pressure system immediately upon shutdown. The motor is mounted on high load isolators to reduce noise and vibrations. Low hydraulic oil pressure – 2,900 psi / 200 bars. A dial, main compensator allows for simple control of the cutting water pressure. A dual compensator provides lower, alternative, preset cutting pressures for tasks such as piercing or drilling. The unit has a hydraulic oil cooling system with a full-flow oil heat exchanger. The oil reservoir has two access doors for easy maintenance. There is an inlet, cutting water, booster pump included in the unit. This insures that the high-pressure cylinders are fully charged and eliminates the extra expense of a separate booster pump. Brass fittings are used on the entire inlet water system to protect against corrosion. There is a full-flow hydraulic oil filter, with indicator, to insure clean oil and protect the system. The frame is constructed from 2″ X 3″ structural steel, box beams. All welds are full welds. No tack welding is used.